This game was inspired by the classic therapeutic game, "The Talking, Feeling, and Doing Game," developed by the pioneering child psychiatrist, Dr. Richard Gardner. 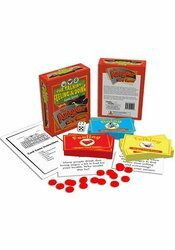 This game focuses on anger and can be used with the original board game, or as a stand-along game. This game was intended to help children explore their feelings and develop new ways to think about themselves and their problems. For 2-4 Players; Grades 1-6.